I was recently contacted by the great and talented, Aaron Nigel Smith , a children's artist and educator based out of Los Angeles, and also a feature on The Activators CD , a great CD I reviewed a month or so ago. 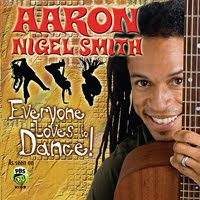 Everyone Loves to Dance, features superstar friends Ziggy Marley and Kevin Richardson, and makes it's digital launch today, January 15, 2010. You can check out a song or two by clicking here . 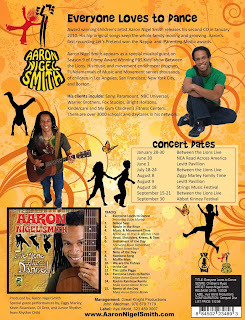 Smith's songs have been described as “some of the best targeted music for kids today,” and PBS agrees, Aaron was recently invited to join the cast of the Emmy Award-winning PBS Kids show “Between the Lions.” He received the NAPPA and iParenting awards for his first release, Let’s Pretend, in 2005. Most recently, Aaron collaborated with Ziggy Marley and the Palisades Children’s Choir on the new hit Tuff Gong release of Bob Marley songs for kids, B is for Bob. 1. Follow this blog, leaving me a comment that you are following. remember your email addy! 3. 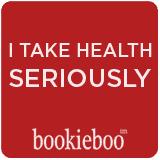 Grab my button and slap it to your page, leaving me a comment of where I can find it on your site. remember your email addy! I was sent the CD Everyone Loves to Dance in exchange for this review. How fun!! I bet my daughter would love this. She LOVES music!! I just became a follower of your blog and would lovee to be entered in your draw. Thanks.